Description: The body is translucent white in colour, and may reach up to 45mm in length. The cerata are extremely numerous, flattened and swollen. The brown digestive gland is clearly visible through the translucent epidermis of the cerata, and becomes purple just below the cnidosac. The cerata have a sub-terminal ring of yellow pigment, with a white ring below this. The rhinphores and oral tentacles are devoid of pigment. 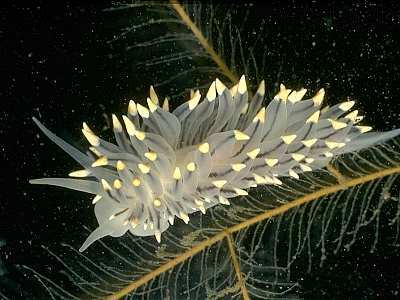 Habitat: Eubranchus tricolor is reported to feed on both gymnoblastic and calyptoblastic hydroids. In Britain it is often found in large numbers on Nemertesia ramosa colonies, during the summer months. An aberrant form has been frequently found on Tubularia indivisa in the spring. Distribution: This species occurs all round the British Isles, America, Greenland, the Faeroes and Scandinavia. The most southerly record is from the Atlantic coast of France. No pigment spots on body or cerata. Picton, B.E. & Morrow, C.C. (2016). Eubranchus tricolor Forbes, 1838. [In] Encyclopedia of Marine Life of Britain and Ireland.